Apparently, Coach Narduzzi was not thrilled that PSU signed a home and away series with Temple. Granted, I’m not thrilled either. Home and Aways should be reserved for teams that have earned that kind of mutual respect. . . perennial top 25 teams. Without Penn State on their schedule, how will they sell season tickets? I hear that bricks from Wannstedt’s recruiting wall that he built around Pittsburgh will be on sale. A dime a dozen. Pitt remains adamant about a home and away situation, despite the fact that Pittsburgh has the OVERWHELMING advantage in this series . . .
Penn State is playing on the road for the 69th time in the 99-game series. Just 24 meetings have been in Happy Valley, while six were at neutral sites. Meanwhile, in Michigan . . .
Jim Harbaugh was hired, at great cost and with towering fanfare, to bring back the bygone days of Michigan football. Harbaughcle? Wish I had come up with that one! Blocked Field Goals: Is there an APP for that? Are you excited to get this 2018 college football season underway? I am cautiously optimistic for Penn State. With their schedule, I can foresee anything from 7-5 to 12-0. Yeah, that pretty much narrows it down. Will McSorley remain healthy? How hurt is Tommy Stevens? Do we have enough depth on the defensive line? Can we get a few breaks? It’s hard to foresee an undefeated season without a little luck along the way. But PSU might still make the playoffs if they can win the Big Ten despite a loss. History pretty much rules out a two-loss team in the final four, unless there aren’t enough undefeated or one loss teams to fill the spots, an unlikely scenario. Since that remarkable upset, Penn State has been ranked EVERY WEEK (AP), the team has gone 18-3, and of those three losses two games were decided by 3 points and one game by but a single point–all to ranked teams. Someone even wrote a book about it. Of course, to be fair, THEM (The-M as in Michigan) defeated #10 PSU 14-9 that same year (we lost to the team that lost to Appalachian State!) and the Mountaineers went on to win the FCS Championship in 2007. Appalachian State is HOT HOT HOT? I think NOT NOT NOT. I like this match-up. It’s a cupcake with some meat. The kind of prey that can bite back. PSU is currently a 23-point favorite to win. I wouldn’t be surprised if the margin of victory is less than that–first game, new personnel, don’t want to show off too much of our new and improved Saquon-less offense. Enjoy the game, PSU fans, and get ready for a heckuva a ride! Penn State has a bye week which gives us a chance to relish again the 4OT victory over the previously undefeated wolverines last week. You can see a panoramic view of the game here. I tried to find myself, but I was blocked by some people standing in front of me. Down in front! So much for my fifteen minutes of fame. The game was far from perfect, but in the end, Penn State made one less mistake than THEM. But the game was not about the Four OT’s, the blocked field goal or the miss by Gibbons. It was everything about losing a lead, and fighting back against all odds. The team never quit. The coaches never quit. The Devin squared tandem of Gardner and Funchess are going to score points on a lot of teams. 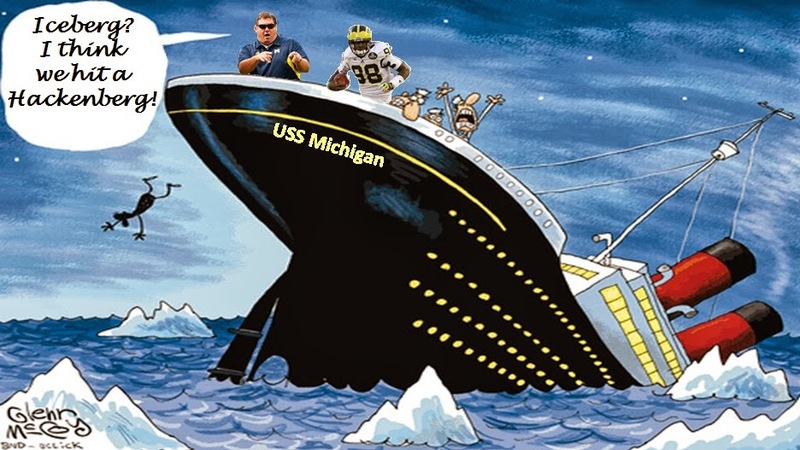 And although Gardner was playing Funchess while our secondary seemed to be playing Funcheckers, our coach made some gutsy calls late in the game while Hoke seemed to be reading Paterno: By The Book and playing conservatively not to lose. Was the QB sneak in regulation brilliant or a poor call that just worked out? It had already failed earlier in the game, albeit I think that fourth down was slightly more than a yard, rather than inches. But what if Hackenberg hadn’t made it? What if it took them twenty seconds to unpile the mass of bodies on the goal line, with no touchdown signal. With no time outs, the clock may have run out on what is now one of the best wins in the O’Brien era. It’s funny how Sunday Morning (or Thursday evening) Quarterbacking works that way. When you win, you tend to forget about the bad calls. When you win, there are no bad calls. If the players execute, the coach looks like a genius. If the kid boots the field goal wide, the coach looks like a conservative jerk who should have played to win. But even some visiting fans had a good experience, the outcome notwithstanding. Although not this guy . . .
What’s worse than losing in 4 OTs? From the above article . . . This weekend was a different story. As the few Wolverine fans trickled into Beaver Stadium they realized that the structure was possibly even more impressive than our very own Big House. The white out stands for what separates the Penn State game environment from that of Michigan. During a maize out, Michigan Stadium has one maize section where the students stand and a mixed bag of maize and blue throughout the rest of the bowl. Fans don’t put much stock in participating in the game atmosphere but simply want to watch their team win. It’s tradition. But in Happy Valley every single fan is ready to cheer like crazy for Penn State from the opening kickoff. The white out was breathtaking. Over 100,000 strong were decked out in all white and shaking white pompoms as Bill O’Brien led his team onto the field. This scene was unlike anything our little group of Michigan students had ever experienced. Though it has a smaller capacity than the Big House, Beaver Stadium is built entirely above ground and is much more intimidating both inside and outside. Second and third decks keep all of the sound in while reaching up much higher than the final rows in Ann Arbor. If you’re wondering how a structure like this can be safe, you aren’t alone. Penn State’s famous chant is the Zombie Nation cheer, which gets the entire audience involved in jumping and screaming along. Because it was one of the things I was really looking forward to, I asked our host, a senior at Penn State, about Zombie Nation. At the suggestion of damaging a concrete structure like Beaver Stadium I was astonished, but when Penn State came back and tied the game with under a minute remaining in regulation, Zombie Nation blared and the back wall of the stadium was visibly wavering back and forth with the Nittany Lion faithful. It was the most incredible atmosphere I’ve ever been a part of, and I wasn’t even in an appreciative mood. Following such an emotional win I expected to be mercilessly harassed by the Penn State students all night, but was surprised when they continued a trend set before the game. . . It was extremely strange. We weren’t sure how we felt about the hospitality because it didn’t feel right, but it was much better than being harassed in Columbus or East Lansing. After the game there were fans that laughed and jeered at us, but the number that told us good game probably outnumbered them. Even though they always seem to beat Michigan in recent years, and they ended our undefeated season, it’s hard to hate Penn State fans because of how cool they were; both when they were sure they would lose and after they had won. 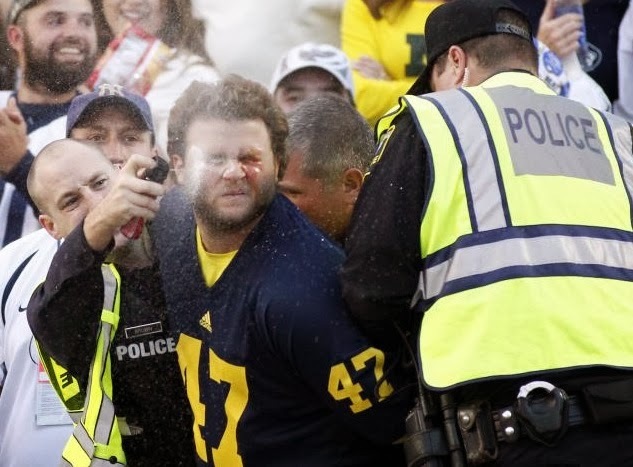 I have been to Michigan Stadium thrice, and have been a-maized at how quiet those games have been except for the odd play or two every now and then. My experience outside of the Penn State section was BAD. The two games I sat with other PSU fans were positive experiences, except for one loss. The stadium is built into the ground, so it doesn’t look like much outside on street level. But it is a really big bowl that doesn’t hold the sound in well. We’ll see how Indiana fares in that venue this week. Speaking of this week, in the Big Ten . . . THEM is favored by 9 points in Ann Arbor over the Hoosiers. After losing to Indiana, I guess we have to root for the wolverines. Did I just type that out loud? Even if we can’t win a Big Ten Title, that doesn’t mean we can’t win a fantasy title, does it? Iowa travels to Columbus to take on the Bucks who are favored by 16.5 points. GO HAWKS! Northwestern is favored by 12.5 and expected to bounce back against the Gophers. The Boilers travel to face the Spartans in East Lansing. Sparty is favored by . . .wait a minute till we add this all up . . . 26.5 points! I hope Purdue wins, but I gotta say, Sparty wins this one. No OTs will be required. The Badgers, favored by 11.5, head to Illinois. ON WISCONSIN! Penn State and Nebraska are both off again. Future Big Ten Team Maryland is favored by 6.5 over Wake Forest. GO TERPS! Miami (FL) is leading UNC 13-7 in the second quarter, but quite frankly, I’ve been watching the Pens who are up 2-1 on the Cryers at the end of two periods. Philly accidentally scored a goal with 2 seconds left to actually make this a game! Notre Dame is favored by 3 over Southern Cal. GO TROJANS! Stanford is favored by 5 over UCLA. Hmm. GO BRUINS! Alabama is favored by 28.5 over Bret Beliema’s Hawgs. ROLL TIDE ROLL! F$U is favored by 3 over Clem’s son. GO TIGERS!